I hope everyone had a great Valentine's Day. It's always a nice holiday when you see couples pronounce their love, even if the rest of us are left out in the cold. V-Day is not a holiday here, as it is a Christian celebration of the martyrdom of an undocumented, unknown, and probably arbitrarily fictionalized Saint Valentine. Still, some people like to call the 14th Yom Ahava, or Love Day. Our neighbors to the East, however, aren't so keen on the idea. I'm sure you probably read or saw this brief on the news, but I figured it was worth a few pot-shots. 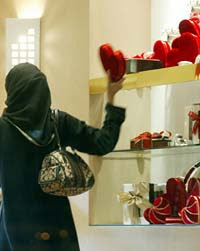 Apparently, Valentine's Day is banned in Saudi Arabia, and some other Muslim states are pushing for similar laws. Saudi Arabia has a legal and police system that carries out sharia, or Muslim law. This is generally the equivalent of Jewish law, Halacha - only scarier. The force that carries out sharia in Saudi Arabia is called the Muttawa. The group is called the Commission for the Promotion of Virtue and Prevention of Vice, a rather pleasant sounding name. A week ago they started making their rounds, visiting gift shops, jewelers, candy stores, and the most publicized of all, florists, all in a very successful effort to literally ban Valentine's Day. They also ban the color red during this period, at least de facto. So, stores will be fined or even closed down, with staff potentially getting arrested, if they don't clear out red roses, red gift boxes, candies in heart or otherwise identifiably Valentiny packaging, and so on. And, they are very serious about all of this. The country's religious leader declared a Fatwa on Valentine's Day, seven years ago, thus religiously demonizing Valentine's Day. A member of the Gestapo -- err, the religious police -- had this to say, according to the AFP: "The West exports to us habits and feasts which contradict sharia and wants us to imitate them. We want to make sure that sharia is implemented. We punish anyone who commits or abets a violation." Valentine's Day is sinful, bringing out improper relations between man and woman, creating an atmosphere of shameful sexuality. I would be lying if I said that Jewish law says otherwise. In fact, where do you think sharia came from? The difference is that Israel is a democracy, and though some want Halacha to be similarly enforced, we continue on with our freedom to sin. After all, I didn't not give anyone a red rose because I wasn't allowed to. I didn't give a red rose to a sweetheart simply because I have no sweetheart. what a delightful read! Very informative, kept my attention, made me want to read more! Also, humorous! Have no fear. Plenty of girls would love to get a rose from my son. He's just not ready. hahahaha. "he's just not ready"
OK, I get it, rice and drains hate each other.